At beginning of the year 2018, planet Saturn is in Sagittarius sign (4th house for Virgo sign) and Jupiter is placed in 3rd house. This new year 2018 will bring you good luck and you have reasons to cheer. Generally speaking, year horoscope 2018 will be favorable for you as the planets are mostly in beneficial positions for you. All year long, Lord North Star is in your 11th House, which will bring in good results. Also, Lord South Star is also in an advantageous position for you. Due to this, any financial problems, diseases, competition will lose their hold over you. Long-standing debts will be paid back. Lord North Star and Lord South Star in the 3rd and 11th Houses will bring positive changes to your life. Whatever problems, obstacles or opposition that were holding you back will disappear and you can achieve your goals. Lord Jupiter in your House of Finance holds your earnings at a positive place. This year will see your economic value rise. The presence of Lord North and South Star in favourable positions shows that you will benefit from your friendship with other state people and foreign associations. Lord Jupiter in your 2nd House means that you will earn a good name at your work place. Starting from January of this year, you will see gradual rise in your salary and work-related perks. This year will be a promising year for you, when looked at in any way. You will make a favourable impression at your work place. You will start working to realise your long standing dreams and vision. Those dreams will come to fruition just like how you had visualized them. So your mental and physical health will be positive and energetic. Those who had suffered from joblessness will be blessed with a good position and ample salary. If you had suffered from lack of funds that prevented you from expanding your business, you will get that funding. Promotions that were denied one will be awarded to you. Pending salary or pay-rises will be credited. If you had had a ill-tempered manager who was at odds with you, you can see him transferred. You will get a new friendly boss who shares your vision. Partners will bury their differences of opinion. Partnerships will be profitable. You will buy a luxury vehicle. The government will aid you. Your mind will be energised. People around you will realise the changes in you and your positive attitude. Farmers, artists, social workers, journalists, tradesmen, daily wagers and employees should make use of this golden period and work hard to attain their aims. Businessmen can note their obstacles vanish and governmental support for their work. You can overcome the middlemen and approach the ministers or officers directly and complete your business successfully. People who are trying for government, bank job competitive examinations will be successful this year. Those awaiting results will also hear good sores against their name. Childless couples will get their prayers answered. Your family will benefit from monetary gain. You will start buying jewels. Whatever problems you faced in obtaining your ancestral property will vanish and you will get your share. Any issue will resolve to your favour. You will be lucky in your dealings and you will earn good profits. You can buy land or houses easily. Long-standing misunderstandings between spouses will get resolved. You will identify the third party who had caused mischief in your marriage without any outside help. You will steer clear off that person. Your long lost confidence will come back to you. You will have the determination to overcome anything. Some will become famous due to their actions. Your relationship with your brothers will grow. Your younger siblings will be helpful. You can help out your brothers and sisters. Your elder siblings will come to your aid. Those who had suffered from unknown or incurable diseases will find their ailments coming under control and disappearing in the end. People who had court cases regarding property disputes, partnership dealings; marital problems will see their cases getting fair judgement. As planet Saturn aspects on your House of career, you will surely make you hot-headed and arrogant. Always remember the greatest virtue of humility that will raise you to the highest. Do not gossip at your work. This will bring about misunderstandings and enmity. As Lord Saturn aspects at your Moon Sign, you will be in a panic mode all the time. You will be in a state of tension. Sine you have to do most of the work all by yourself, you might get confused and make wrong decisions. During this time, try to stay objective and ask the opinion of family elders. Their experience will guide you. Women will earn the goodwill of your family members. They will take up your opinions. Working women will have salary raises and promotions. Your employers will support you. You will buy stuff from saris to anklets. You will be treated with respect in your family and work. 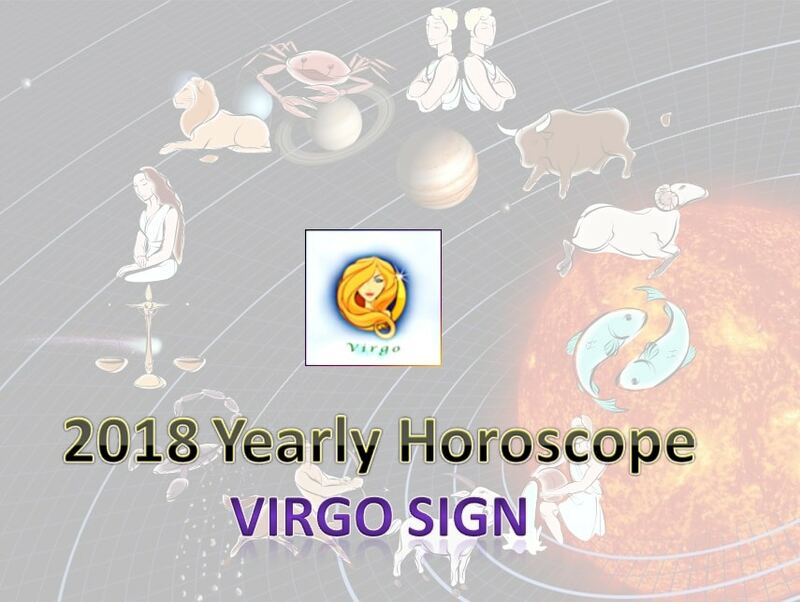 The year 2018 astrology will be a turning point for the Virgo moon sign.